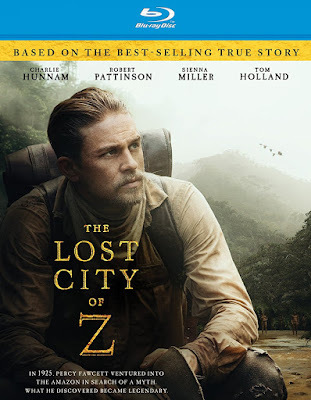 Adapted from David Grann’s best-selling novel, The Lost City of Z follows the true story of British explorer Percy Fawcett (Charlie Hunnam), whose aspirations as a soldier are thwarted when his country instead chooses to send him into the Amazon on a map-making mission in 1906. This perilous journey would alter the course of Fawcett’s life when his discovery of ancient artifacts leads him to believe in the existence of a previously unknown civilization in the jungle. The mere idea is met with skepticism and criticism, as it diminishes the significance of Britain’s claims of historical importance in the birth of civilization. But even while his theories are treated as blasphemous, Fawcett refuses to ignore the evidence that he has seen, dedicating much of his life to the task of proving what nobody thought possible. As simple as these claims may seem, the efforts to prove them took a lifetime risk with few rewards. Even the first mission of simply traveling through the Bolivian jungles in order to map out the border of Brazil is met with many casualties and took years to complete, so that the decision to return seems unthinkable. Despite his surviving men bearing witness to the wonders hidden in the Amazon, Fawcett’s discoveries were met with skepticism by the majority of Britain’s scholars, who refused to believe that a culture of savages could have accomplished elements of civilization long before the British. With the help of fellow explorer James Murray (Angus Macfadyen), Fawcett and his two most trusted men (Robert Pattinson and Edward Ashley) decide to return to the jungle with a new mission in mind. Without going into too many details for fear of spoiling the riveting (albeit modestly paced) adventures of The Lost City of Z, it is important to note that no journey taken into the jungle is ever easily accomplished. Each expedition is met with unique problems, forever thwarting Fawcett of his ultimate goal. The stakes are raised even higher by the amount of time each journey takes, which equates to time Fawcett must spend away from his loving and supportive wife (Sienna Miller) and their children. As Fawcett’s eldest son (Holland) grows older, his frustration over his father’s absence shifts to admiration and aspirations, leading to a final mission taken together. Charming as Holland may have been as Peter Parker and his superhero alter-ego, this is the type of film that got him that high profile job in the first place, and is one far better suited for his talents. The sophistication of the filmmaking also allows Hunnam to give one of the more nuanced performances of his career, and may be the first film to truly utilize Pattinson’s talents. Disguising his good looks beneath a bushy beard and spectacles, Pattinson seems finally to have come into his own as an actor, shedding the heart-throb persona that he never seemed comfortable with throughout any of the Twilight films. It is a subtle performance, but one well deserving of supporting actor nominations. Unfortunately, with a release early in the year and little studio faith, we are unlikely to see this film receive any attention come award season. Not only does the industry have a short attention span, but the films that are nominated are nearly always the ones that the studios spend exorbitant amounts of money promoting. This is how one of the best films of 2017 will likely fade into obscurity, despite three hot young stars and career-making direction by James Gray (The Yards, We Own the Night). David Lean may be turning over in his grave at the treatment of this film, but the fact that it was made at all is reason for him to sit up and applaud. Although missing many of the alternate viewing options that often now come standard with Blu-ray releases, The Lost City of Z does have a handful of decent special features. The highlight of these is a commentary track with Gray discussing the filmmaking process in detail, though there are also a couple promotional featurettes included as well. These cover the adaptation process, the difficulty of the location shoots. Also included are excerpts from the expedition journal.